The first thing I consider is how I want to divide my Operator resources to be either Carriers or Modulators. 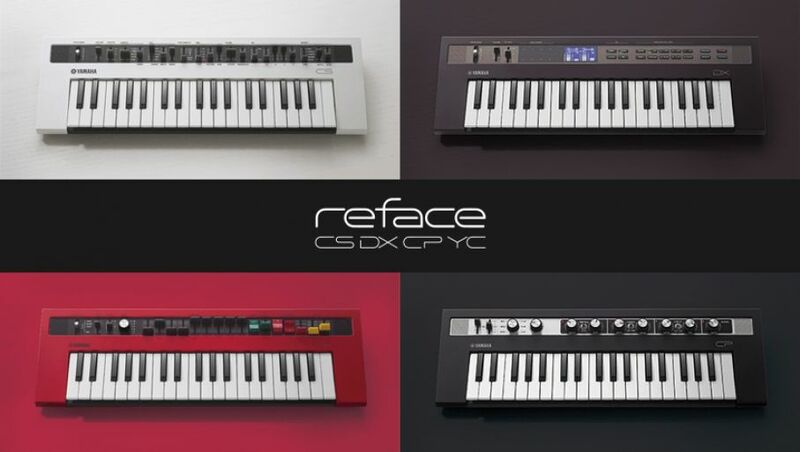 The Reface DX is a 4-Operator FM engine. In general, using more Modulators gives the possibility to have more widely varied, complex timbres and harmonic (overtone) control. Using more Carriers gives the possibility of thicker, detuned sounds or the ability to have multiple pitches played for each key, such as octaves or fifths. Compare the Voices "Detuned Saws" referenced in our prior article with Peter Jung's "Fat Analog Sawtooth Pad". For the Voice Detuned Saws, it uses two 2-Operator stacks for an emulation of an analog two-oscillator synth sound, then uses the effects to enhance the 'thickness'. Because it uses Modulators to create the sawtooth wave harmonics, the brightness can be controlled with velocity dynamics and the Modulator Envelope for 'filter' sweeps and decays, etc., by changing the EG's Rate and Level values. In contrast, Peter's Fat Analog Sawtooth Pad uses all four Operators as Carriers, having to rely on the Carrier Feedback to create the sawtooth wave harmonics. This allows for a much thicker and fat detuned four-oscillator analog sawtooth synth sound and doesn't need the effects to thicken the sound. In addition, you can re-tune some of the 'oscillators' (Carriers) to octaves, fifths or other intervals. However, with no Modulators the only harmonics available are simple sawtooth or square waves depending on the feedback setting. More importantly, without any Modulators you lose the ability to create complex or unique waveform harmonics as well as losing any behavior or dynamic change in the harmonics with either velocity or the EGs for 'filter' sweeps, etc. You have to consider this trade-off when envisioning the type of pad sound you want to create; when choosing the Algorithm – a complex & dynamic pad needs more Modulators. Operator 2 creates the initial sawtooth harmonics of the timbre with a 1.00 Ratio Frequency setting in combination with Carrier Operator 1's Frequency setting of 1.00. The Envelope shape for Op 2 is a medium rate decay to a level of zero, so the sawtooth harmonics starts the initial first second or so of the sound. Operator 3 creates the square wave harmonics of the timbre with its 2.00 Ratio Frequency and the Op 1 setting of 1.00. The Envelope for Op 3 is set to slowly fade in over 3-4 seconds or so as you hold sustained notes. Operator 4 creates the repeating harmonic 'shimmer' harmonics of the timbre with its 4.66 Frequency setting and the LFO Pitch Modulation Depth setting. The Envelope for Op 4 is set to a very slow fade-in of about six seconds, so you have to hold notes for 7-8 seconds before this portion of the timbre comes in. The repeating effect is created by setting the LFO Amplitude Modulation Depth (AMD) for Operator 4 to 43 to emulate a repeating, or gated, Envelope. As you continue to hold notes past 10 seconds, Op 1 will fade back in to add additional harmonics to the shimmer. Finally, to thicken up this one-Carrier sound, I'm using both the Flanger and Chorus effects. OK, time for a quick quiz question: Where have you seen the core structural components of this sound before? * then using Flanger and Chorus Effects for final polish. The core components – the Algorithm and all Operator Ratio Frequency settings – are the same in both Voices. Again, I encourage you to play around with changing the Level, Feedback and Frequency settings for the Modulator Ops 2, 3 & 4 and listen to how they change the sound. To hear a subtle variation of this example Voice using different Frequency settings and faster LFO shimmer effect, check out the Voice "Evo Example" on Soundmondo. For an example of a more complex variation check out the Voice "Complex Bell Pad" which has edits to the Op 1 & Op 4 Envelopes to add the bell tone in the attack, along with adding Pitch EG to Op 4 to accentuate the percussive strike for the bell tone. Also, the Frequency settings for Ops 1 and 3 have been changed for a more 'digital' timbre. This shows how much complexity and control can be achieved with three Modulators. By detuning the two separate Operator stacks, we can create a lusher, thicker sound. However, there will be less opportunity for creating timbral complexity and behavior as there is only one Modulator Operator in each of the Operator stacks to create and control the harmonics. One way that I compensated for some of the loss of complexity is by mixing up the Ratio Frequencies for the Operators in the different stacks, so that in effect we're mixing two different sounding waveforms with our "two oscillators." In the first stack, the Frequency for Carrier Op 1 is set to 2.00 and the Frequency for Modulator Op 2 is set to 1.00, which along with the Feedback settings for both Operators and the Op 2 Level create a pulse wave timbre with a soft filter sweep type behavior. In the second stack, the Frequency for Carrier Op 3 is set to 1.00 and the Frequency for Modulator Op 4 is set to 2.00, which along with the Feedback setting for those two Operators and the Level setting for Op 4 gives a square wave timbre, again with a soft filter sweep type behavior. Note that the Envelope Level and Rate settings are different for Op 2 & 4. The values for Op 4 are set to make the square wave timbre (from the Op 3 & 4 stack) fade-in slower and fade-out faster compared to the Op 1 & 2 stack pulse wave sound. In addition, the Envelope Level 3 and Rate 3 settings for Op 2 and Op 4 have them eventually fade back in with longer held notes. So overall, the Op 1 & 2 stack pulse wave timbre will fade back in sooner than Op 3 & 4 stack square wave timbre. All these variations in the Envelope Level and Rate setting mixes up the harmonic behavior over time to also help compensate for the diminished complexity and control available because there are fewer Modulators as compared to the "Complex Pad Example" Voice. For another example of this approach for creating lusher pad sounds check out the Voice "Subtle Evolution Pad" on Soundmondo. So there you have it – two different approaches to pad sounds. As always, take some time to tweak the Frequency, Level, Feedback and Envelope values and listen what happens to the sound. Also play around with the Effects. Modulation effects like the Chorus, Flanger and Phaser mixed with lots of Reverb or longer Delays can be very effective enhancements to the final sound. Finally, some additional pad Voices to check out on Soundmondo: "Aetherium", "Seraphine 1", "Seraphine 2", "Mobius Trip", "Neeto Repeeto", "Digi Repeeto" and "Evolviane". Want to discuss this lesson? Join us for a discussion on the Forum here.